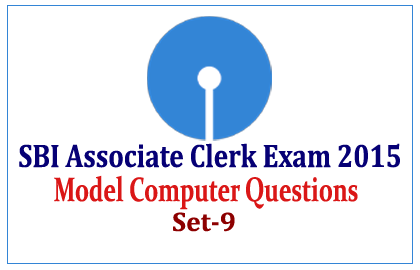 List of Model Computer Questions for the SBI Associate Clerk Exam 2015 were given below. Candidates those who are preparing for those exams can use these questions to score more marks. 1).Which among the following is an input device which moved by the user on a flat surface to causes a pointer on the screen to move accordingly? 2).A barcode reader is an example of a (n) ___________. 3) From where, you can access the Recycle Bin icon? 5).Digital camera is a ___________ device. 6).What is meant by Mailing Kst? 7).In travelling, which computers are portable and convenient for users? 8).Unsolicited email is also called as___________. 9).To save an existing document with a different name, we have to_________. 10).which among the following software applications is used for performing numerical and statistical calculations?